Happy autumn, everyone! Fall is my favorite time of year and we've been out and about taking the dogs for lovely long walks and enjoying the air and the fact that we can wear long sleeves without sweating our brains out. I hope you're enjoying your weather, too, wherever you are. September's break was a good one for me, and I hope all of you had some fabulous 'free' time with your beads. If you're in the group, I would love to see what you got up to over the month, please feel free to post a pic! October's prompt is the stitch I learned first - the very first thing I ever beaded; brick stitch. 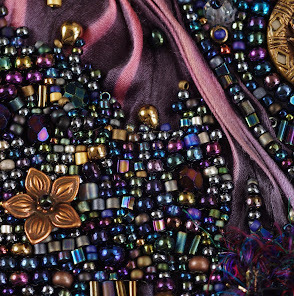 It was the gateway to beads for me, and so it holds a special place in my heart. I actually don't have ANY photos of brick stitch that I made, I looked and looked, and they're all gone! But I must have made thirty or forty pairs of earrings, and then I made barrettes in the shape of three hearts across in brick stitch and sewed them onto felt and glued them to barrette blanks. One in particular sticks out for me - it was a white background and the hearts were in rainbow colors, and it was given to a little girl who saw it one day and was just so unhappy when her mom couldn't afford to buy it. I couldn't let her walk away without it! It made me massively happy to be able to make her smile that day. 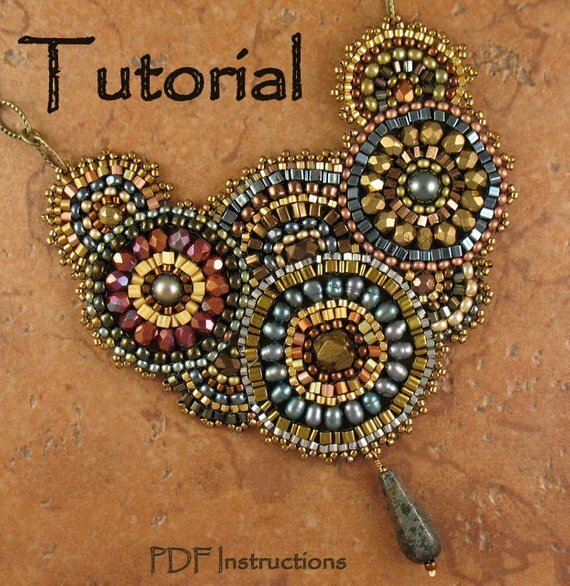 I found a few wonderful tutorials, if on the off chance you haven't already learned this stitch - and they're REALLY wonderful. 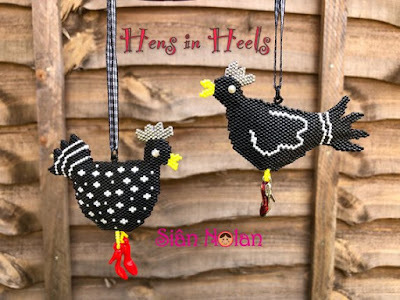 I mean, lookit this: Sian Nolan's fabulous Hens in Heels!!! You can find it in her shop, HERE. 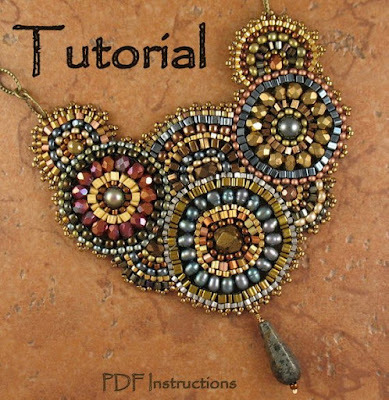 Then there is the marvelous Laura Boudlouche Zeiner's Enchanted Evenings necklace tutorial, which I simply love. 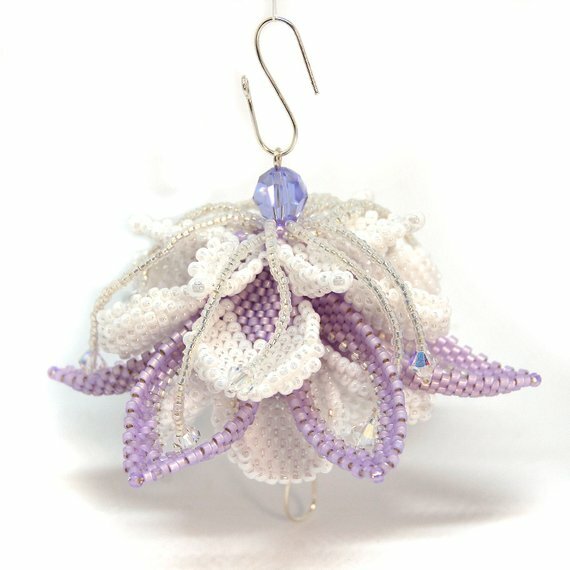 Elegant, but oh so sparkly! You can find it HERE. 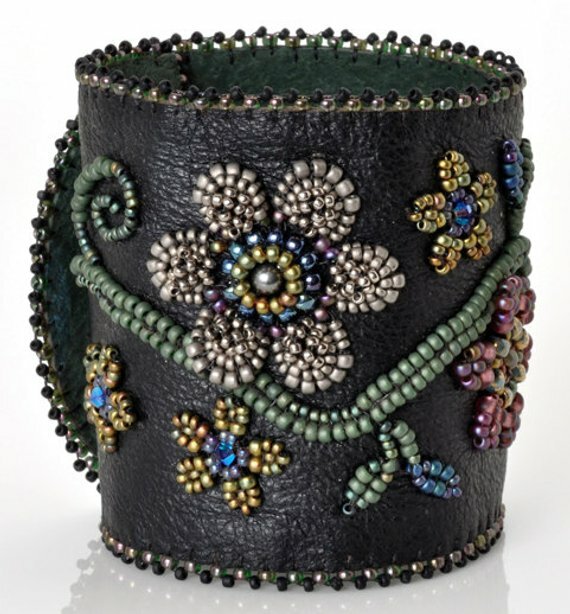 Tamara Scott Designs has a cuff tutorial that features brick stitched components in a beautiful design called Elegant Garden HERE. Crystal Star Gems (Tracey Lorraine) has this gorgeous ornament - please click through to the listing to see the photos of this beauty and how it morphs! Fuchsia Flower can be found HERE. 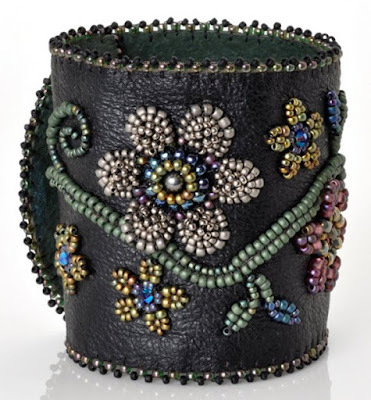 And Heather Collin has a sweet but edgy bracelet called Geared Up HERE. So that's it for me, I hope you find this month's prompt inspiring! 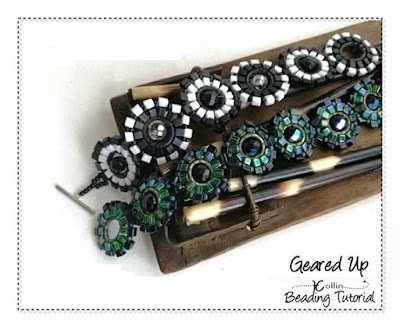 Happy beading, all!